** Updated 2/1/16 - see my new posting on green onion pancakes. Mystery solved. Oh yes, I have blogged on this before. It's a household favorite. 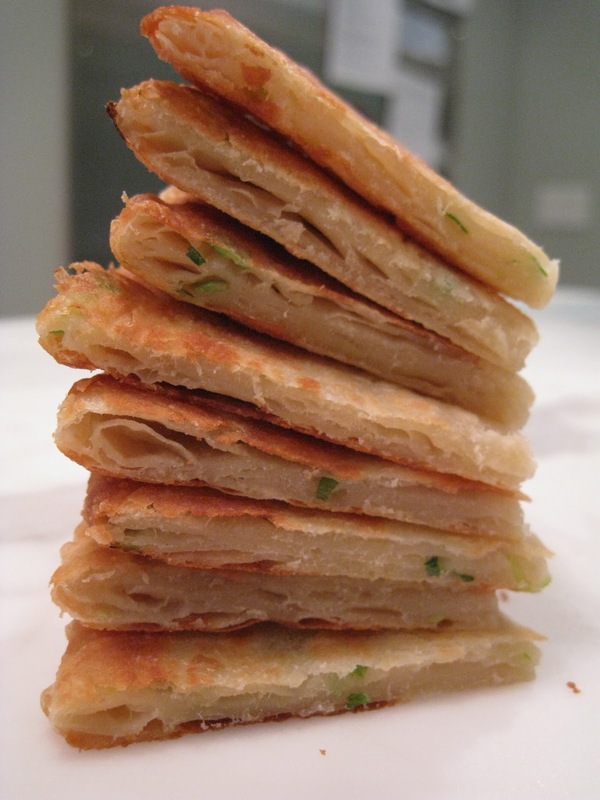 My sister makes killer scallion pancakes. Our favorite place to get them is the Szechuan Noodle Bowl in the I.D. in Seattle. And I am ever struggling to perfect them. In my opinion, they should be thick, crispy on the outside, soft but flakey on the inside. I have always achieved the crispy outer, but flakey inner? Not so much. So, today was go number, maybe, 50? or more? I've lost count. They are always tasty, but not perfect. This was today's shot. Using a standing mixer with a hook attachment, stir together the flour and salt. Combine boiling or near boiling water with the oil and with the mixer running, slowly pour in the water/oil mixture. Run the dough hook on the #2 speed until dough forms into a semi smooth ball. Remove dough and knead with your hands until smooth. Separate into 3 equal pieces, knead to form into balls, cover and let rest for several hours. Knead each ball for a minute or so before rolling out. Using a rolling pin, roll dough out until very thin. Drizzle a little oil all over the dough and use a brush to spread evenly. Sprinkle with salt, and then the green onions. I'm sorry I don't have measurement for this. The salt is a go with the gut amount. It's just enough to evenly dust, not completely coat the dough. Roll dough up into one long log. Stretch it out and roll it flat slightly with your rolling pin. Cut into 4 equal pieces, then roll each piece into a ball. Repeat these steps with each of your large balls of dough. Cover the small pieces with a clean towel and let rest for an hour before rolling out. Roll into small rounds, about 6-8" in diameter and about 1/4" thick. To cook, use a heavy cast iron skillet with about 1/8" oil, over medium heat. Fry slowly until crispy and brown, flipping a few times on each side and then pressing down on the pancakes once they have crisped a little on the outside. Pressing down on them will help cook the thick center. These are best served hot off the pan. They lose their crispness once they get cold, but in our house, we'll eat them cold out of the fridge as a snack. I make a batch as they freeze well and you can cook them right out of the freezer. These were my best effort yet, but still not as good as the Szechuan Bowl. beautiful! i am trying these.